MEMPHIS, Tennessee - AutoZone Park will be "a world of pure imagination" in 2019 for one lucky fan and a guest. 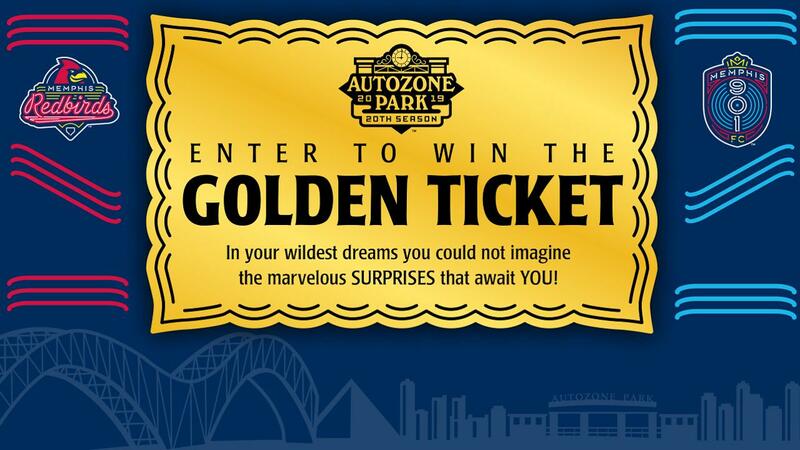 From today until 11:59 p.m. (CT) on Friday, March 1, fans can register to win a "Golden Ticket" for AutoZone Park in 2019 - a free season ticket for both the Memphis Redbirds and Memphis 901 FC, plus a free ticket to any other event held at the stadium this year. And just like Charlie brought his Grandpa Joe to the Chocolate Factory in "Willy Wonka and the Chocolate Factory," the Golden Ticket winner will be able to bring a guest to every event as well. To register, fans can visit www.autozonepark20.com. "As the great philosopher Willy Wonka said, 'don't forget the tale of the man who got everything he wanted… he lived happily ever after,'" Redbirds and 901 FC President Craig Unger said. "Well, this Golden Ticket is everything a Memphian could want in 2019. You and a guest will see every single Redbirds and 901 FC game, and you'll be there for any other event we have at the stadium this year - you're looking at 90-plus of the most exciting moments happening in our city this year. All for free! "Yet again, my friend Willy Wonka said it best. 'If you want to view paradise, simply look around and view it.' We're excited to welcome this lucky AutoZone Park Golden Ticket-winner and their guest into our paradise every time we open the gates in 2019. Just please don't chew any of the gum we haven't tested yet. We don't want any giant blueberries." The Golden Ticket promotion includes, at minimum, two season tickets to each of the 70 regular-season Redbirds home games, two season tickets to each of the 17 regular-season 901 FC home matches, two tickets to the St. Louis Cardinals exhibition game against the Redbirds on March 25, and two tickets to the Triple-A National Championship Game on Sept. 17. The winner would also receive two tickets to any potential home postseason play or home soccer friendlies, plus any other public events booked for the stadium in 2019. No purchase is necessary to enter or win. Additional rules and regulations apply and are detailed at www.autozonepark20.com.